The ease of mobility provided by golf carts is quite indisputable. The carts make the movement of persons and gear a whole lot easier. But there are times when the weather doesn’t sit well with you and your cart. There’s a likelihood of being soaked up in the rain or literally baked in the heat of the day. 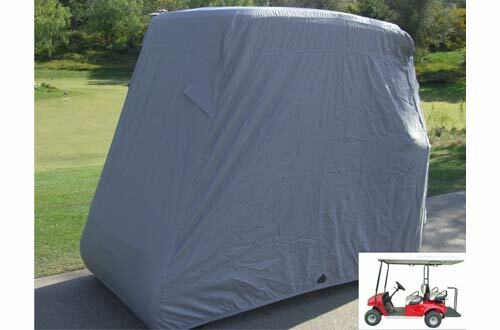 To keep yourself and your cart protected, you’ll need a golf cart cover. 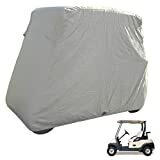 This is a tricky part since you’ll need to select the best golf cart covers that are durable, weatherproof and with a size that fits your cart without a hitch. Many different brands have something good to say about their covers. However, you need to know that not every word is the truth. 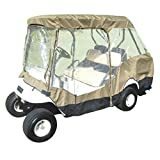 To help you make a purchase that’s worth every penny spent, we present a recommendation of the best golf cart covers you might want to try out. Have a 4 passenger golf cart? This golf cart cover might just suffice. The cover comes in a grey colour and fits standard carts with a roof length of 80 inches. It’s fabricated from heavy duty satin polyester sporting a polyurethane undercoating. This creates a cover that’s resistant to UV rays, dirt, and weather damage. The cover is reinforced with a double stitching for optimized durability. Built-in vents come in handy to prevent lofting and condensation. There’s a zippered closure for easy access. Grommets tie downs keep the cover secure so that it doesn’t get blown away by the wind. A duffel bag is included for easy storage. 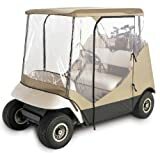 This golf cart cover gives you a chance to get a clear view of the surrounding while remaining protected. The cover sports clear window and door material with the rest of the fabric coming in heavy duty polyester. The door provides the convenience of a zippered access for easy entry and exit without having to remove the entire cover. This cover holds up well to any weather condition and has the tie hooks that keep it from being blown away by the wind. You get a front pocket that accommodates small items. 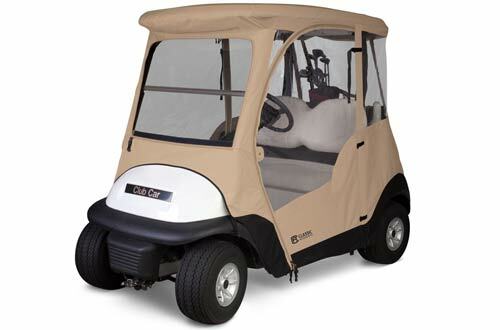 The cover is designed to fit a 2-person golf cart. 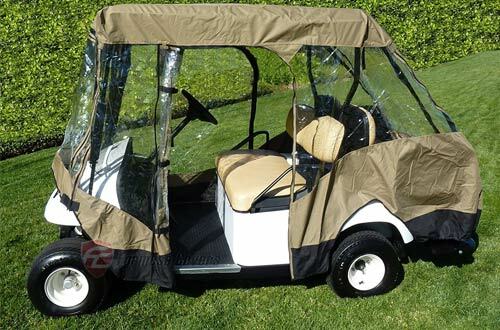 Get the convenience of this reversible golf cart cover. 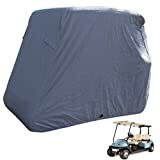 This cover is designed for 2-passenger golf carts sporting roofs of up to 58 inches. It’s made of a satin polyester fabric sporting a polyurethane undercoating. This cover shields you from the sun, dirt, and adverse weather elements. Vents are included to prevent lofting and provide improved airflow. A double stitch is used for maximum durability. The cover is held down by grommets to keep it secure even in windy weather. You can slip it on or take off with ease, thanks to a zippered closure mechanism. The cover packs in the included duffel bag for easy storage. 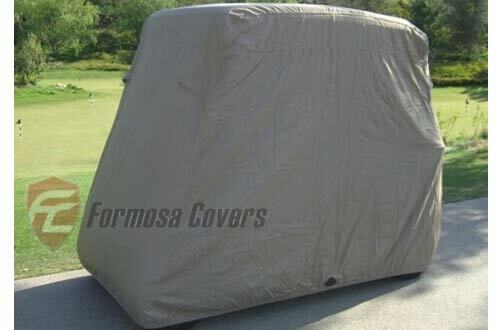 This golf cart cover comes in handy to accommodate carts measuring 83 inches long. This is a cover that doesn’t compromise visibility, which means that you get to drive without having to remove it. It’s a weatherproof cover that keeps UV rays, dirt, and other elements at bay. The windows and doors are made of a super-clear PVC material and sport zippered closures for easy access. 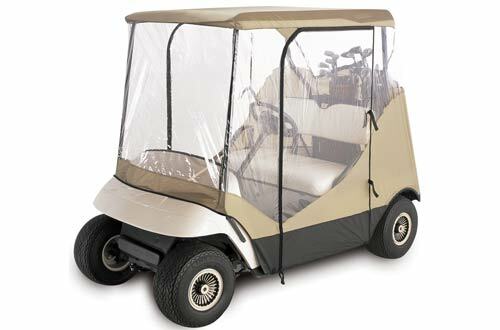 This is a perfect cover for those owning 2-passenger golf carts. It’s a cover that lasts with no shrinkage to deal with. The cover packs away easily in a carry case. 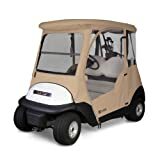 This is for short-roofed – 58 inches – 4-seater golf carts. It’s a commercial-grade cover designed to withstand whatever the elements have in store. Made of 600D polyester with a PU coating, you get a fabric that’s virtually waterproof. It doesn’t shrink and has a zippered construction to give you an easy time getting in and out of your cart. Visibility is guaranteed by super-clear PVC doors and windows. This means you get to enjoy your ride while remaining fully protected from the elements.